Only two comics on my pull-list this week means that it is the perfect time to attempt my addition of reviewing one older comic per week. For the debut of this feature I am going to review the classic Chew #1. When I first started reading this series I was blown away at the food universe that John Layman created and was not prepared to where that journey led. Darth Vader #13 - An interesting development is afoot as the Empire is vying for control of Mon Cala, home of Mr. Ackbar. It is pretty interesting to see Admiral Ackbar pre-admiral title working on his home planet. Apparently there are some valuable resources on this underwater planet and Palpatine isn't taking too kindly to a rumor that the Jedi are present. In addition to positioning a fleet in the planet's orbit under the control of Tarkin, Vader and the inquisitors are attempting some "diplomacy". They have the attention of who I believe is Obi-Wan and I am anticipating an action packed follow-up to this issue. 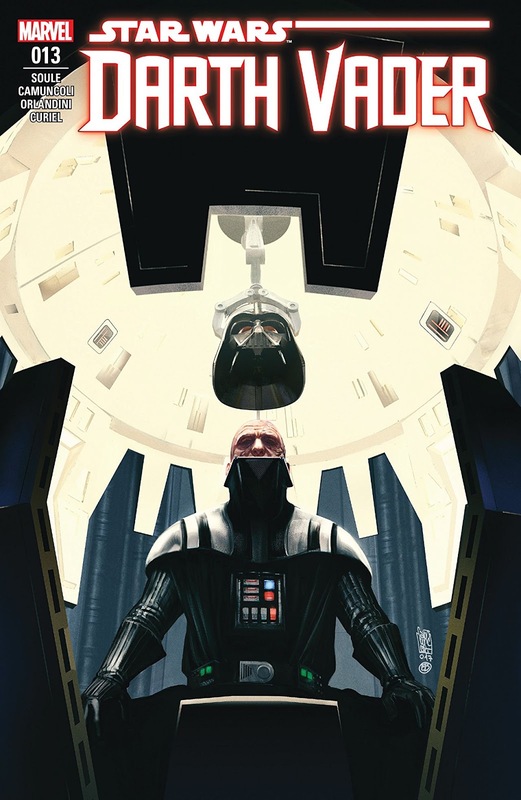 One of the best Vader issues in a while and I am definitely curious where this arc is heading. DuckTales #7 - I think we can make a good case for Joe Caramagna to join the Disney XD crew at the writers' table for season 2. He has done an amazing job filling in the gap between seasons with his mini-stories that are an absolute delight. My favorite this week involved a ghost town and was very reminiscent of classic Scooby Doo. 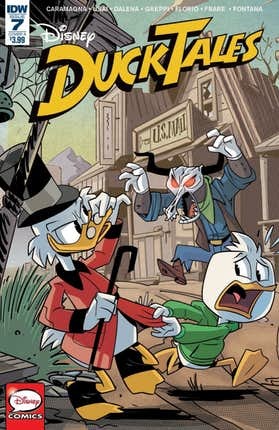 If you or your kids enjoy DuckTales then this is a title that should be on your pull-list and one well worth your time and money. Chew #1 - The opening page of this comic provides a hint at what to expect in this off-the-walls series. It opens with someone chopping some vegetables for a soup and accidentally cutting themselves. Most people would proceed to then deal with the wound, but this person uses their bloody hand to add in the final ingredients. Chew focuses on detective Tony Chu, who works for the FDA. It is a time where chicken is outlawed and his skill as a cibopath is extremely valuable. What is a cibopath exactly? It is someone who gets visions of the life of the food he eats, with the exception of canned beets. If he eats a hamburger, he will get a flash of what the cow ate and how the cow was slaughtered. This particular set of skills comes in extremely handy when dealing with food related crimes. This debut issue featured some of the over the top characters and gore that fans would come to experience throughout this amazing series. We meet D-Bear and witness Chu's partner take a hatchet to the face. 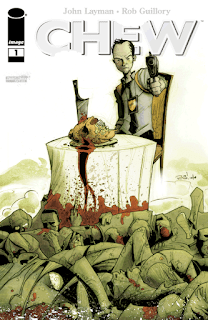 This series is illustrated by the amazing Rob Guillory who shines in bringing this bizarre series to life. I can't imagine a different artist on this series. Good times. SIDE QUESTS: Fonts and Typefaces!